Here a continuation of these stories is to suggest more details. The Lithuanian version of this page will appear soon. I'm inviting all you to inform me about any facts of Lithuanian heritage abroad. That'll help to create the wholesome web of pages related to Lithuania. The links to this page are desired. Father Burba arrived to assume his duties as pastor of St.Mary's on August 22, 1889. He had been instructed by Bishop O'Hara to use both the Polish and Lithuanian languages. However, his stay at St.Mary's lasted only nine weeks. On Thursday, October 24, 1889, a split between the two nationalities became permanent. Instead of the one national parish, there were henceforth to be two. Not only did the Lithuanians secede to form St.Casimir's, they also elected to take Father Burba along with them as their founding pastor. The first person to come to the assistance of Father Burba, thus giving him the needed courage, was Father W.Donahue. Pastor of St.Vincent's Parish, Plymouth, who invited him to conduct services in St. Vincent's Auditorium. There, on October 27, 1889, the Lithuanians held church services in their native tongue. Thus was born St.Casimir Parish! After the Bishop had given his sanction, Father Burba was soon joined by a group of persons who recognized an opportunity to have their own place of worship. They contributed their time, their energies, their means, and also solicited funds for the project. Outstanding among them were Adam Adzdrauskas, Michael Balyta, Casimir Brazys, Casimir Ivanauskas, Thomas Kazlauskas, Anthony Pajaujis, Joseph Paukstis, Sylvester Paukstis, A.Maslauskas, Matthew Mociejunas, N.Tamulis, Michael Tautoris, and John Zukauskas. When enough funds were raised, Father Burba purchased a plot of land in what was then Plymouth Township, and which later became Larksville Borough. This site, situated on a hill overlooking the Susquehanna River and Plymouth Borough, was centrally located. It was meant to serve Lithuanians living throughout Wyoming Valley. Parish records reveal that father Burba went as far as Pittston to minister to the Lithuanians living there. "And to provide a filling abode where the Holy Sacrifice of the Mass could be offered, the Catholic people came afar from the country side bringing materials, and after many months of arduous toil, and by the sweat of their brows, erected a church in which to worship the King of Kings, Our Lord Jesus Christ. And here they worshipped, and their children were taught the word of God". Construction began on the church and rectory on June 1, 1890m and the cornerstone was laid on August 24, 1890. While awaiting their completion, the members of the infant parish continued to worship in St.Vincent's Auditorium. The first prayer service was held in the new church on December 21, 1890. After a great deal of work and hardship, but amid great joy, their new church was blessed by Bishop O'Hara on january 1, 1891. The cost of the church and rectory, both wooden frame buildings, was about `$16.000. Much of thanks to "Brothers Entertainment" at Plymouth and personally to Gary for a help and an information. We prompt you to leave your words, commentaries, and additional information - about that parish and other places related Lithuania and Lithuanian heritage. Write, your words will help to point us new paths the Lithuanians went across the world. They left the signs and we need to see them. Let's be active - not as mankurts at prairies (steppe) of Sarozeques. NOTE: if you entered your message and don't see it now, click "Refresh" (or "Reload") button of your browser - to reload this page. My name is Aly and I would like to know if you would have any interest to have your website here at lithuanian.net promoted as a resource on our blog alychidesign.com ? My name is George and I'd like to know if you would have some interest to have your website here at lithuanian.net promoted as a resource on our blog georgemartjr.com ? Are there any records of those buried at St. Casmir's, or do you know if there are records from the undertaker Peter Maslowski whose name I see on many death certificates? Specifically, I have the name of an infant, Frank Kosloski who shows he was buried in St. Casmir's cemetery on Feb. 24, 1930. Many thanks for any information. another Shakis looking for geneology My grandparents immigrated from Lithuaniain the early 1900's. Louis and Anna Shakis had two sons, ALbert and Anthony Shakis. ANrhony died in 1948 and we are trying to find any records on him. My name is Aly and I would like to know if you would have any interest to have your website here at lithuanian.net promoted as a resource on our blog alychidesigns.com ? buried in St.Casimer's cemetery. Who has records for this cemetery?? On his petition for naturalization my uncle adam Ryscavage listed damyock in suwalkai province as the village where he was born. Anyone know anything about it? I've been searching for my Great-grandparents from Lithuania, Joseph Rasjewicz and his wife, Rose Burba. I recently discovered that Joseph died from gangrene after a mining accident in 1906 at the Parrish Colliery in Plymouth, PA. He funeral Mass was held at St. Casimir Church and he is buried in the parish cemetery. Im looking for my great grandfather. His name was Stanley stevelvich? This message is for Jackie Haley. From your message in 2010 it is highly likely that my husband Jeffrey is related to you. Stanislas Antonowicz had a Baby named Frances, she was baptized on 5/7/1905 and born on 4/28/1905 listing Stanislas and Agatha as the parents. We have a Certificate of Baptism from the Church dated 03/21/1942 with an embossed seal. Your message helped me clarify Frances parents names. They are tickey to make out on the certificate and the spelling is nothing I had seen before. Feel free to contact me if you are still looking for connections. In fact I may have a letter from someone named Joe with a cleaning company named Anthony's Carpet Cleaning in Florida. I'm looking for my relative Jan Woznalis (Jonas Vaznelis) born 1894 who came from Russia to Edvardsville Pa (near Wilkes-Barre)in 1913 to his uncle. This message is from an intermediary; I can only understand Lithuanian, or Polish. Please write me back if you have any info on him, or his children. Or advise me on any further action I should take in order to find any info on my uncle. She reminds me - an elnaget, radiant flowering beauty wrapped with an exquisitely enrapturing jacket made of immense handmade crafted felt sourced from somewhere exotic and sensible. Her representation exhibits pure exuberance and fine details on how she captures on the tiniest imagery frit of magenta color from the scarf by paralleling with the color of the jacket. The patterns and transitions captivate the eyes and strongly draw one in. The back layers leave me speechless. The skirt shows the calyx-type flowing light puff layers with simplicity of the slim leather simple handbag and the boots are nicely deep rooted as great stems and branches. Her gentle ocean blue eyes and nicely coral lips are highlighted by the dashing diamond shaped metal earrings. She is a "stunning" light among the steel and glass buildings and cement streets. Thank you for the delightful, pure visualization with a striking harmonious composition and contours - true sophistication with a unique cultural sense. My mother Emilia and her Mother and her 2nd husband Petras Skarna were parishioners. Petras passed away in/around Thanksgiving 1957 and my mom's mom around Feb/March 1958. Petras wife passed away in around 1928 and left a daughter and son and the son passed away in the early 1930's. They lived at 281 Phillips st in Lynwood. My grandmother was Anna Helen Zanzinger. Her father was Eduard, and her mother was Wilhemia Nae. My dad and her first marriage certificate say she was born in Kovna, but I have not been able to find out anything more about this line of my family. She was born in 1897 or 98, and came to the United States around 1911. My grandmother's maiden name was Burba. She came to the US via a ship named Prussia. I do not know for sure what city in Lithuania that she came from. She married Isadore Dargavich. Her first name was Anna. Her brother, Peter, was living in Mahanoy City, PA and was her sponsor. She arrived May 18, 1896. Port of departure was Hamburg. THE HISTORY OF PLYMOUTH PA. WAS A TRAGEDY AND SHAMEFULL ON DISCRIMINATION ON THE LITHUANIAN CATHOLICS BY POLISH EXTREMISTS. "MARTIN WIKES AND THE POLISH- LITHUANIAN CHURCH WAR'" WILKES THE LEADER OF POLISH NATIONALIST AND HATER OF LITHUANIANS , OPENED THE GRAVES OF TWO LITHUANIAN CHILDREN BURIED A DAY BEFORE IN A JOINT POLISH-LITHUANIAN CATHOLIC CEMETERY. THE COFFENS ARE THROWN OVER THE FENCE, ONE CHILDS BODY WAS LACERATED BY A PICK AXE IN SEVERAL PLACES USED BY THE POLISH CATHOLICS! LITHUANIANS ARE DEGRADED BY POLES FOR CENTRIES, AND ARE TOLD BY POLISH PRIESTS ,THAT LITHUANIAN LANGU AGE IS A PAGEN LANGUAGE AND YOU MUST PRAY IN POLISH ,TO HERE YOU. (see the HISTORY OF PLYMOUTH PA.) IN WILKOPIDIA, THANK YOU. Contact St. Robert Bellarmine Parish for information on St. Casimir's Church and Cemetery - it is a new parish formed from the consolidation of St. Casimir's and St. Alyosius Church in Wilkes-Barre: 143 W. Division Street, Wilkes-Barre, PA 18706; (570)823-3791. They also have a Facebook page. Gershon...I see you are researching my ancestors. Please send me any info. you find as I would be interested in seeing it. I have lots of photos of them. In one, the person named has a Bible and rosary in her hands. I have photos of ancestors buried in Catholic Cemeteries. Because you're so interested, you can contact me directly. You might want to research your own ancestors for posterity. How does one answer a person's post on this site? Hello. I have relatives buried in the "new" St. Cashmir's (Lynnwood, PA) cemetery up the mountain since the "flood". Can you please tell me the name of the cemetery and general directions. Is anyone out there related to kazis Vansevicius( my father) who went to Cuba with parents Joseph and Elizabeth(Vilkas)and younger sister and older brother Joseph in 1920s? Kazis/Charley later went to U.S. and lived in Brooklyn NY on Havemeyer St. I know he had cousins in the area and on Havemeyer St. Charley is dead now but I'd like to meet some of my Dad's relatives .I know he had relatives in Pennsylvannia, too. I am trying to trace Grandparents listed as Gotrydas and Marijones Verneryte but my mothers name is Ema Kynaite on her birth certificate. She was born in Mureikuos and baptised at the Lutheran church in Sakai. Her parents were German. How do I continue with this search? My grandparents last name was Yadversus (not sure of spelling) and other names were Tamashusky. Would love to hear about any of them. My paternal grandparents were Jerome (maybe Heronim) and Rose Sujeta Poznanski. I would like to know if you have any record of their marriage, probably in the 1903-1906 timeframe. Thank you in advance for any help you could provide. I am told the word Burba means to gripe to moan or to bleat like a sheep in the Lithuanian Language. I was also told that in ancient lithuania and throughout the middle east any name that began with BR was the son of whatever followed. So Bartholomew was the son of Tholomew and Barabus was the son of Abas. So it would seem that Burba may have been the son of Ba, the sound a sheep makes, who was a shephard. With that I will say Ba Ba as I feel a little sheepish in adding that bit of history to the family sheepskin. please send any information on the remavege family from 1800-2011 to me. it is greatly appreciated and confidential. i need information on edward john remavege, george and john for my family tree. Where did they move the ST Casimir records when they closed the church in lynnwood? If you have questions, you should give your email address. I know of a family friend Kaslauskas (dec.) in Binghamton, NY. Email me for more info. My family names are Krasauskas, Kvietkauskas, Rincunas, Wogentis, Gudnikus, Marozas, Valentinacus. I can help some with these names. There was a large Lithuanian community in Binghamton, NY. Google your last names and also look them up on Facebook. I'm looking for information on the Antonowicz family. Stanislas Antonowicz was Lithuanian, born in Russia c. 1867, emigrated to the US aboard the Scandia in May 1895, last place of residence Suwalken Russia. Three years later his wife Agata Antonowicz sailed to NY with two children, Theofila age 8 and Franciszek, age 3. They were living in Plymouth, PA by 1810 at which point there are two additional children, Anna and Frances. Both Stanley and his son Frank worked in the mines. Frank was my grandfather, left the mines in 1913, joined the army, moved to Union, NY in the southern tier by 1920 where he married my grandmother. I believe his mother, Agata [a.k.a Augusta, Agatha] probably died in the early 1910s. I don't have any information on the rest of the family once Frank left Pennsylvania. He changed his name to Anthony at that point. Anyone know anything about these folks. It is nice read about someone withe the same last name as Father Burba. Looking for relatives of Elizabeth vilkas vansevicius who died in 1985 and was married to Joseph Vansevicius. Both emmigrated to Cuba in the 1920s .Does anyone know why they may not have made it to the U.S. where they wanted to go? They had relatives in Pennsylvania. These were my grandparents.Is there a town in Lithuania that sounds like Stragus? To Kathy Bower - My paternal grandfather was Joe Gugas who was a miner in Wilkes-Barre at one point and had also lived Springfield, IL with his wife, Teodora Molnikas, and finally in Detroit, MI. Joe apparently migrated to the US with two friends, Anton Anilionis and _____ Ustinsky, who apparently married Joe's sister (Petronia or Petronella?). I have a photo of the Utinsky and Gugas families on a front porch poss. IL or PA. Joe first came to the US in 1904. I believe John/Jack Utinksky was killed in the Bataan March. Please comment to prbloodworth@bellsouth.net. I am looking for any information on my Lithuanian geneology. My grandmother was Nell Utinsky, born is Springfield,IL in 1905. Her parents were Chris Utinsky (sp?) born in June 1875. His parents were Baltraneus Utinsky and Ursala Geggarich (sp?). 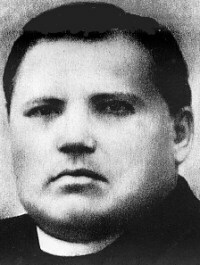 He married Petronella Anna Gugas (His second marriage. I think that his first wife died. They had a son named John who died in WWII). She was born in 1875. Her parents were Vaitaiks Gugas and Ann Laurenitis (sp?). I believe that they were both born in Lithuania. I understand that he was a miner and immigrated to Baltimore (I have no idea which ship), then moving to Pittsburgh, eventually moving to Illinois. Does anyone have ANY information regarding this part of my family??? Do you have access to parish members list from 1908. My father's family arrived in Wilkes Barre at that time. I am looking for help in my genealogy search? The name was Wilhelm and Anna Pusch or Busch. Would you have the names of other Lutheran churches in Wilkes-Barre at that time? Does anyone have any relatives with the name "Balanda"? Does anyone know how we might try and save St. Casimirs in Hanover Township Pa from closing??? Would getting a priest from Lithuania help and how would you go about doing so. It is a shame that the Church is trying to close the ethnic parishes stating it is a lack of Priests. When the Old Latin Mass was no longer is when churches began the downward spiral to there final ends. If we could return to the Old Mass i think there would be better hope. the Lithuanians know this more than most. there is a church called st casimer, in cleveland that the bishop shut down last sunday, nov 8 but there could still be hope, before stripped and bulldozed. please read the comments on internet it is under st. casimer closing and THEN add comments too, as many as possible. spread this request to others PLEASE, quickly. My wife's great-grandfather was named Casimir Brazys, b. abt. 1840 in Russia (married to "Ludwig", b. abt. 1844 in Russia). They had a son, Antonius (Anthony) Brazis/Brazys, b. 25 Mar 1869 in Russia, who came to Baltimore, Maryland, by 1913. "Anthony" Brazis married Alexandria Krasauskas (Kazlauskas? ), b. 13 Feb 1875 (Vilnius, Lithuania/Russia), whose father was Peter Krasauskas (related to Thomas Kazlauskas?). Do you know if any of this information fits with the family information for Casimir Brazyz, an important contributor to the birth of St Casimir Parish? Thank you for any information you can provide to me. My dad was Lithuanian but our name was messed up by immigration. We ended up with Vervewski, but it may have been Veverskis. My dad grew up in Plymouth, PA. I am trying to trace roots, but cannot find much. Any help or suggestions would be appreciated. All of his family are deceased. I went to Holy Cross Perish of the So. side of Chicago and graduated in 1964.The order of Sisters were "The Sisters of St. Casimer". Is this group of nuns from your area? I remember when asking one of the sisters where she was from and she told me Pennslyvania. married kate russo. i am very interested in learning anything about my family's history.thank you. Researching surname KASLAUSKAS from Lithuiana. My mother-in-law's family is from there. Can anyone help me? Thank you. My grandparents Michael and Anna Mark DaDurka (DaDurkiewicz) were married in St. Mary's church Oct. 24, 1899. They came to USA in 1915. I'm 62 years old and I' m want to pass on the family tree and stories of the family. I have a substantial listing of the DaDurka's in the US. Anyone is interested I will forward the information. I have been unable to contact anyone in Lithuania. Sad but true I do not read or write any other language but English. If any request is made in Polish or Lithuanian is will seek to have it translated in the US. If you can pass on my e-mail to family in Lithuania I would be very grateful. EASTER EGGS by Antanas Tamosaitis. Please advise if you know where i can find a copy to buy. Hello, My husband's Great Grandmother was America Burba b. abt. 1848 in Kentucky USA She married Thomas J. Caswell. Her father was Miles Peter Burba, her mother Azuba Burba (they were cousins) Would like to know if you know their ancestors. Thank you very much. I was told that the name Paugstat originated from the Lithuanian word "Paukstis." My relatives were from Tilset, Prussia. Does anyone know anything about Paugstat/Paukstis connection? I am in the early stages of researching my family genealogy. I am trying to locate any information on the Burba and Kasulis families. John Peter Burba is my great grandfather. He reportedly came to the U.S. from Lithuania in the 1890's(?) with four brothers (two went back to Lithuania) and a sister. In America John Burba married to Agnes Kasulis. The family settled the Shenandoah, PA area. Any information about either of these families would be greatly appreaciated. In establishing St. Casimir's the name Matthew Mociejunas was mentioned. Is there any information on him for my genealogy chart which I am so interested in establishing. Please let me know! I am trying to locate information on my family - the Maslowsky's of Omaha, originally Maslauskas in Pennsylvania. My great grandparents names were Bernardas and Eleonora Maslauskas. Found the A. Maslauskas listed here and wondered if there is a family connection. Any help would be appreciated. will come up with the answer to our prayers through us. Stravinsky nee SHAKIS, and his brothers. iron curtain. She could not find them. I have Lithianian books, art, folk art and national dress for sale. For instance, a large unique painting by Antanas Tamosaitis. My family came over in the early 1900's. Grandfather Ignatz Dambrauskas came over first, then his son William, they somehow got to Rock, Michigan. Sent for my mother Anastasia, she came over in 1910 at the age of 14. I guess they needed a housekeeper. The story gets a little blurred here. She got to Chicago -married a widower Frank Rimkus, who had two sons Vito & Bart. They had another child, Albert. They divorced. She ended up in Rock, Michigan, where she met my father John Lasko( Laskauskas). We ended up in Chicago. The Bridgeport area, where all good Lithuanians seemed to converge. Attended St. Georrge's Church and school. We moved out of Bridgeport in 1935, but stayed on the good old Southwest side of Chicago. if anyone has the answer. A new community has been born where "anything Lithuanian goes." discussions opposing views are encouraged and welcome. Gila Monster is our Mascot. as I see it, between the cynic and the curmudgeon. who is somehow superior by virtue of his spite. The curmudgeon, on the other hand, is in his heart an idealist. but to bring about a degree of enlightenment to their recipient. For unlike the cynic, it is not people whom the curmudgeon hates. 1. Thou shalt never talk evil about another Lithuanian. 2. Thou shalt never talk evil about another Lithuanian. 3. Thou shalt never talk evil about another Lithuanian. Hi, my family has been here now to the third and fourth generations. I do know that my grandfathr had a brother who came here with or around the same time. My family grew up in and near Forest City, Pa. Does any one know or any other Paukstis families? I understand the name is quite common in Lithuania, but not so common in the States. We are looking for other Lithuanian's with surname of "SHAKIS"
Roman Catholic churches in the US. Can you be of help?? ?